Often times we talk about "Mozilla community members" as volunteers or interns- but really, they are much more. While there are only three or four staff on most of the projects that I am developing, there are often a minimum of a dozen contributors who are truly user testing, designing, localizing and building each tool. These are teenagers, designers, educators, engineers and people who are just truly passionate about Mozilla's core mission to build the next generation of webmakers. Community members- take time out of their regular lives every week to feedback and push the project to new limits. Last week I had the opportunity to participate in a three day sprint on developing unifying resources for Mozilla's distributed community of webmakers who organize events. 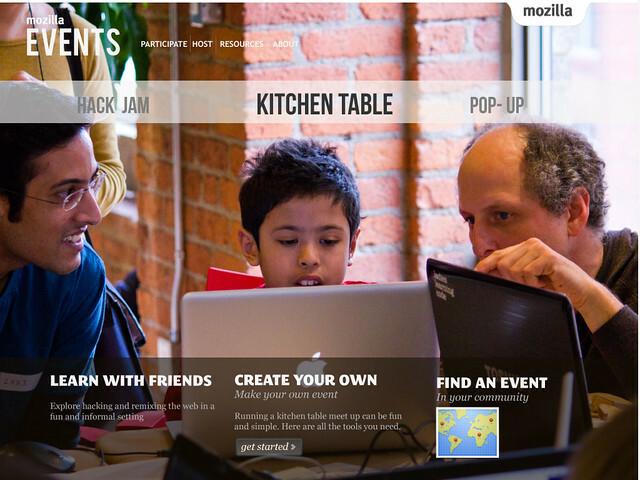 While we spent most of our sprint trying to think of tangible ways for people to be inspired, connect to Mozilla's webmaking philosophy and make cool stuff, at the end of the sprint, ultimately it came down to thinking about the members of the Mozilla community. 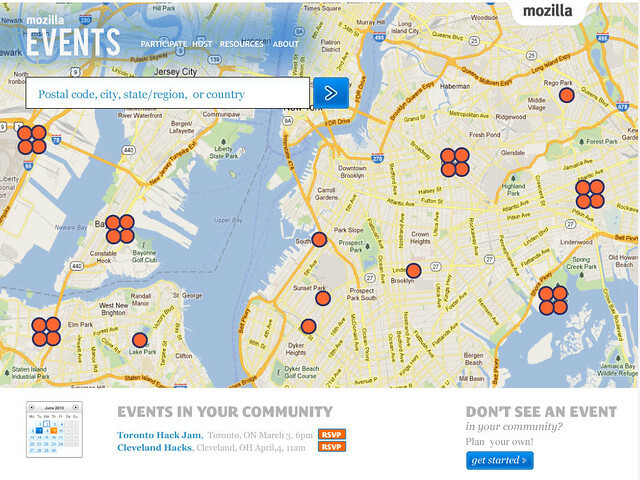 "The power of the anecdote is so great that no matter how boring the material is... it has a momentum in and of itself "
This second mockup is of the event finder- here you have the chance to locate events happening in your community. The map will geolocate to your specific part of the world and then you can fine tune to find more events in your community. I was quite inspired by some other orgs that take advantage of the power of storytelling including: Tupperware, Ikea, 350.org and the Obama campaign site. The idea behind all of this is that once your feel empathy for the stories, and feel motivated to participate in this webmaking movement- then we will help you to connect to resources that will support that kind of learning. For more detailed information on the event kit, please read my colleague Ben Simon's informative blogpost on Moving forward with distributed events and Michelle Thorne's post,ti tled "The Mullet"